Painter, Ralph Du Casse was born in Kentucky. He attended the University of Cincinnati (B.A. 1940) and University of California, Berkeley (M.A. 1948). In addition he studied with Hans Hofmann in New York and attended California College of Arts and Crafts (M.F.A. 1950). His early paintings ranged from a loose, gestural abstraction to a predominantly linear style rooted in Cubism and resembling the early work of Diebenkorn. His paintings of the 1960s and 1970s were dominated by simpler, thinly stained abstract forms with sources in Oriental philosophy, although some bordered on figuration. He taught at University of California, Berkeley, California College Arts & Crafts, and California School of Fine Art, and through the 1970s was chairman of the art department at Mills College in Oakland. 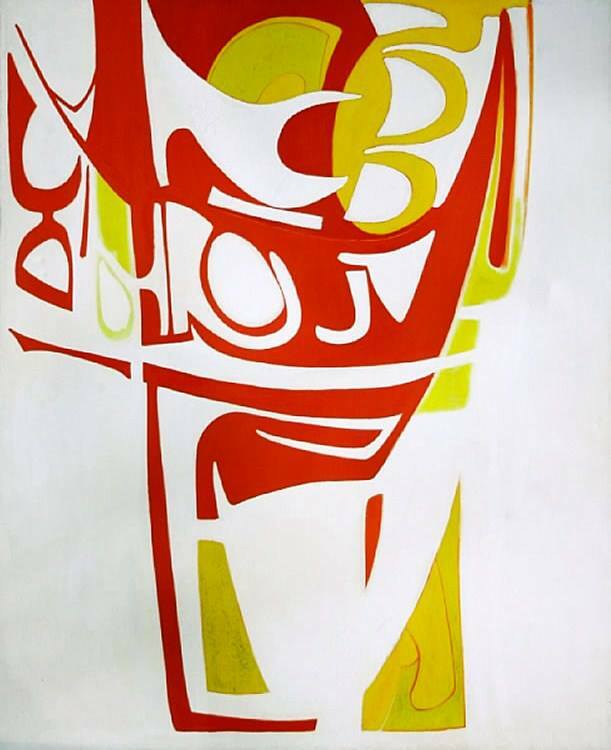 Post-War California artist, Ralph Du Casse attended the University of Cincinnati, B.A., 1940; University of California, Berkeley, M.A., 1948; studied with Hans Hoffman, New York; and California College of Arts and Crafts, M.F.A., 1950. He taught at the University of California, Berkeley, California College of Arts and Crafts; and the California School of Fine Arts. Du Casse was chairman of the Art Department at Mills College during the 1970’s. COAST ART, IIIrd Biennial of Sao Paulo, Brazil, 1955; CALIFORNIA PAINTERS, 40 Painters, Municipal Art Center, Long Beach, 1956; Contemporary American Painters, 1950-1955, Stanford Art Gallery 1956; 76th Annual Painting and Sculpture Exhibition of the San Francisco Art Association at the San Francisco Museum of Art, 1957; 78th Annual Painting and Sculpture Exhibition of the San Francisco Art Association at the San Francisco Museum of Art, 1959; The Art Bank of the San Francisco Art Association, 1958, 59, 60, 64, 66; Winter Invitational, California Palace of The Legion of Honor, San Francisco, 1960, 61, 62, 63, 64. The Oakland Museum; San Francisco Museum of Art. Thomas Albright, Art in the San Francisco Bay Area, 1945-1980; San Francisco Museum of Modern Art, The Painting and Sculpture Collection; San Francisco Art Association (Institute) Catalog of the Art Bank. David J Carlson, Carlson Gallery, California. Carlson’s specialty is Post-World War II California artists, and he is preparing a catalogue for a 2004 traveling exhibition of these artists to several California museums. Ralph Du Casse was born in Kentucky in 1916 and attended the University of Cincinnati and received his M.A. at U.C. Berkeley. He studied in New York with Hans Hofmann and received a M.F.A. in 1950 from the California College of Arts and Crafts. He taught at U.C. Berkeley, California College of Arts and Crafts and the California School of Fine Art. He was chairman of the art department at Mills College in Oakland. His early painting was that of a linear style rooted in Cubism resembling the early work of Diebenkorn. His work of the 60s and 70s consisted of abstract forms with sources in Oriental philosophy. His works are in the permanent collections of the San Francisco Museum of Modern Art and the Oakland Art Museum. Doris A. Warner discovered the world of stone carving and returned to the university to the university for instruction in sculpting the three dimensional form, A journey to Pietra Santa Italy, (the Mecca of sculpture), gave her month with the Italian professor, Pasquale Martini, experiencing the Italian method of stone carving.She returned with three tons of marble and then she started working exclusively in this medium. The impressions and images gathered from extensive travel in Europe, Asia and Africa had inspired her works. One of the architectural wonders of the world. The Great Stupa of Borobudur, Java, was the source of inspiration for a series of five sculptures, the five sculptures are intended to be specifically architectonic in form and yet there is an unequivocal sense of history- frozen in time. The mysterious quality of the temple carving are translated into bronze icons ( lost-wax process) and places on the carved marble. In addition Doris focused on the abstracted female figures which emphasized body movement through rhythmic flow of mass and line. She sculpted in a series, rework the same concept until it had been expressed as powerfully as possible. All her sculptures were a” one of a kind” addition to any art collection. The painting by Emmy Lou Packard (1914 – 1998) is gouache on board, it measures 52.8×24.5 inches,it was created in the early 1940’s. It is part of the Farhat Art Museum. SAN FRANCISCO — A remembrance celebration of the life and work of artist Emmy Lou Packard, who brought the same passion to the cause of social justice and peace as she did to her paintings and prints, will be held at the First Unitarian Church, 1187 Franklin St., at 3:15 p.m. on Sunday. Ms. Packard died of diabetes and related illnesses in a San Francisco convalescent home on February 22. She would have been 85 years old April 15. Throughout her long career, Ms. Packard upheld the ideal of easily understandable public art. Although she admired some abstract modern art and even bought “elitist” paintings by her friends to adorn the delightful studio homes she created in North Beach, the Mendocino sea-front, and the Mission District, her goal was always to reach out to the people en masse. Thus, her large murals and, particularly, inexpensive woodblock and linoleum prints — often of multiethnic children and workers — brought her a large following among radicals and conservatives alike. Yet, like her friend and teacher Diego Rivera’s works, her art never succumbed to Stalinist social realism, although she did look to Moscow and later Beijing for many other things. Her hand was too deft, her wit too incisive, for such humorless crudities. Up until the 1990s, when she taught and encouraged young Latino artists to work on a big scale for the common good, she adhered to the goal of a Marxist popular art. Yet she herself occasionally was close to abstract expressionism, as in the tremendous sand-cast concrete mural that serves as a parapet on the Golden Bear Center, facing Lower Sproul Plaza, at the University of California at Berkeley. Done in the mid-1960s, it was finished just in time for the huge student demonstrations for free speech and against the Vietnam War. Such political engagement came to Ms. Packard almost as a family inheritance. She was literally born into left-of-center politics, in an agricultural cooperative community in the Imperial Valley that her parents, Walter and Emma Packard, helped to found. A strong Packard tradition of feminism dates back to the 1850s when Ms. Packard’s great-grandmother, Elizabeth Ware Packard, led successful struggles in 13 states to obtain due process of law for women, who previously could be committed to mental institutions simply on the word of their husbands. Ms. Packard’s father, Walter Packard, was an internationally known agronomist. In 1927, taking his family with him, he went to Mexico City as a consultant on the government’s historic land reform program. There, Ms. Packard, who drew and painted precociously at the age of 13, was taken by her mother to meet muralist Rivera and his wife, Frida Kahlo. Rivera later recalled the beauty of the little girl “with the face of a French Gothic angel plucked from the reliefs of Chartres.” When he came to San Francisco to do a fresco for the Treasure Island World’s Fair in 1940 (now at City College of San Francisco), she was his full-time assistant and painted side by side with him on many areas of the 1,650-square-foot mural. By then, Ms. Packard was a full- fledged artist who had studied from 1932 to 1936 at UC Berkeley, where she was art editor of the Daily Californian, the student newspaper, and of Occident, the campus literary magazine. She was also the first female editor of the Pelican, the humor magazine. In 1934, she startled her sorority sisters when she eloped to Nevada with the brilliant young architect Burton Cairns. She then astonished the student body when she brought her baby, Donald Cairns, to class with her. In 1939, her husband died in an auto crash. Ms. Packard returned to Mexico to live and work with Rivera and Kahlo and took the famous photographs of them that are now icons of 20th century art. She also did some 300 oil paintings, water colors and drawings that she exhibited in 1941 and 1942 at galleries in Los Angeles and San Francisco, and a one-woman show of her works in oils at the San Francisco Museum of Art (now the San Francisco Museum of Modern Art), which firmly established her career. By 1943, she left aside her fine art to work as an engineering drafter in defense industries, most notably in the Kaiser shipyards. As the war wound down, she was able to do some 100 shipyard paintings, dominated by cranes and other heavy machinery, but light and optimistic in feeling. During that exceptionally productive period, she experimented with plastics in light sculptures, illustrated third-grade textbooks for the San Francisco public schools, organized the annual San Francisco Arts Festival and was a founder of Artists Equity, a group very like a union for artists. A memorable moment, in 1949, was a group show of her paintings, together with work by her friends Robert McChesney, Edward Corbett and her future husband, Byron Randall. By 1952, she was producing wood and linoleum prints of local crab fishermen, net menders, artichoke pickers and other workers. Another trip to Mexico enabled her to study new developments in mural techniques. She did many murals and other adornments for schools, and had the happy idea of inviting the children to help make mosaics or assemblages of seashells, pebbles, broken ceramic tiles and other found objects. Among her most interesting commissions were for murals and room decorations for the Lurline, Mariposa and other Matson Line cruise ships. In 1960, she and Randall moved to a Victorian house facing the sea in Mendocino, where they had charming studios and a house gallery. She became known as a formidable environmentalist, helping to protect the shoreline from ugly developments. With equal fervor, she opposed the Vietnam War and donated posters and drawings to groups such as Women for Peace. But her marriage to Randall was dissolving. In 1969, she returned alone to San Francisco, where she became a much-loved figure in the Mission District, championing its Latino culture a generation before others discovered its vitality and charm. She also led the victorious fight to save Anton Refregier’s frescoes depicting California history in the lobby of the Rincon Annex post office on lower Mission Street. She spent much of her later years preparing a biography and appreciation of Rivera, illustrated with her photographs. She was unable to finish the work.